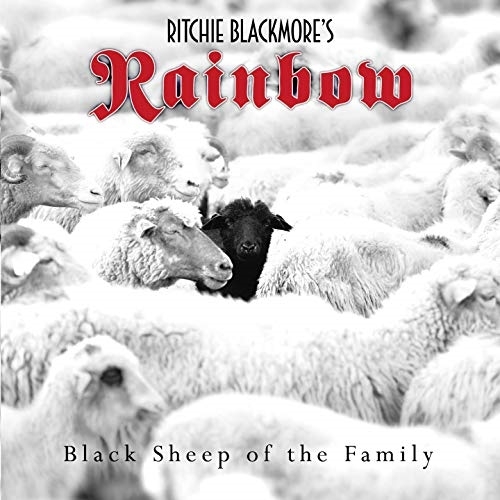 Ritchie Blackmore has re-recorded Black Sheep of the Family as a single with his current Rainbow lineup. The song was written by Steve Hammond, guitar player for Fat Mattress — band founded by Jimi Hendrix Experience bassist Noel Redding in 1968. The track first appeared on the eponymous 1970 Quatermass album with no less than two members of the Purple family — John Gustafson on bass and vocals and Mick Underwood on drums. Blackmore’s 1975 recording session for the track was, of course, what kick-started Rainbow as a band in the first place. Thanks to Blabbermouth and Gary Poronovich for the info. Posted by Nick Soveiko on Friday, April 12th, 2019, filed under News. You can follow comment on this post through the RSS 2.0 feed. You can skip to the end and leave a comment. Pinging is currently not allowed. Interesting… one tune, but no doubt made with Ronnie Romero on the Rainbow edition & then Candice on the Blackmore’s Night edition. Two birds with one stone!. What’s so special about this song? I’m very curious an think it will be a fine version. I hope that this time the new song is better produced as the last ones. With real instruments. Ronnie James Dio of “Elf”, Matthew Fisher of “Procol Harum” and Hugh McDowell of “ELO”, which was planned as a single with “16th Century Greensleeves” from the same line-up as B-Side. It was never released. He re-recorded it with Elf (minus Edwars and Nauseef) for the first Rainbow album – the well known version. The rest is history, but without Black Sheep of the Family, there wouldn’t be the world’s best writing duo of Ritchie Blackmore and Ronnie James Dio…Unsurpassed to this day! I have tried to listen to, and watching, the new “Rainbow” but I can’t sit through it all. It’s too painfull to listen to, the guy cannot play rock’n’roll any more. Try to listen to the japanese girlband Band-Maid in stead, they rock. Let’s wait for the b-side/bonus track(s). The song tells the story about………….Ritchie Blackmore… He is the “black sheep of the family”…We all know that! Hey Ritchie…. how about something NEW!!!!!!! @2TheoM, RB likes it… that’s all. It’s the song that got his rainbow up & running. Ritchie and Ronnie didn’t write it, and there are previous versions around. My own favourite is by Chris Farlowe. It was written by a guy called Chris Hammond and was first recorded by his band Quartermas. Apparently Ritchie wanted Deep Purple to record it but the others wouldn’t be in it. That was the last straw for Ritchie so he got Ronnie interested and the rest is history. I was disappointed when I first heard the first Rainbow version because it is not as good as the Farlowe version. I think this is just great news. It´s of course a cover, but as You all already know very well, Ritchie likes this song. That´s the reason. But what I really wait for is the news of the re-released First album….I guess there´s no clue about those mastertapes…? Congratulations Ritchie for Your birthday today ! @4 Kevin. You aren’t listening are you?! To all, I know that Black Sheep in fact started Rainbow. To my humble opinion I think it is one of the weakest songs Rainbow recorded. If I remember correctly, Black Sheep was a Quartermass song that Blackmore wanted MKIII to cover. They refused so he took it to Rainbow. @Kevin 4 Errrrrrr, did you not read the article. They never wrote it. @6 Nupsi59, the b side/bonus track will be called “More Of The Same!”….. This is a great song live when they did it with Ronnie James Dio. Ritchie would break into slow blues in the middle of the song, then finish with the rest of Black Sheep Of The Family. Out of all the Rainbow tracks he picks this? Is this how it will be for the next few years? I wonder what method he uses to pick an old Rainbow track to re-hash – blind folded using a pin? Very Atomic Rooster’ish, but you can envisage that it would have worked very well with Coverdale’s and Hughes’ dual lead vocals approach. Gustafson’s and Hughes’ singing especially, are not a million miles apart. I still think that the others only turned it down as a payback for Blackmore having shelved the double album concept they initially wanted for what became Stormbringer. That would have given everyone except Little Ian an album side = four tracks, Blackmore using part of that for Black Sheep would have been no issue then. Instead, the others felt stifled when Blackers wouldn’t have it and gave as good as they got. Who knows, Stormbringer might have become Purple’s Physical Graffiti, decadent yet artful. The 1st version of this tune I heard was by Chris Farlowe and The Hill release From Here to Mama Rosa’s, check it out. Sorry but… Ritchie and Ronnie didn’t write that song…. Next? Hey everyone, I may be wrong, but I believe RB is doing this for himself… not for all of us. Nostalgia is a powerful thing for the elderly. Lighten up!. @20-uwe….thanks for the link! Very nice version! Now I’ll have to check out the Chris Farlowe version. Really love the Chris Farlowe era of Atomic Rooster – His takes on Black Snake and Breakthrough are fantastic. Saw the videos on you tube last year and became a big fan. The version of Black Snake where he is eating PB & J sandwiches while in between singing the song is awesome! Then the Breakthrough take comes next. That became one of my most watched videos of the 2018. By the way, Happy belated Birthday to Ritchie Blackmore! My favorite guitar player ever. Celebrated the past week by soaking in the excellent live 1970 Aachen performance with great versions of Wring that Neck & Mandrake Root. Delicious CD to have on in the car, I love rocking out to it. @24, agreed. Ritchie made his decision back in ’97 when he chose to head down acoustic highway with Candace and simplify his life, I’m guessing he’d had enough of big tours and ego’s and was at peace with himself by doing so. Whatever reasons were that he’s back with Romero in a much scaled down and slower paced Rainbow are his and of/for his family. Now in his mid 70’s, we’re getting less creativity and more going through the motions for shits and giggles and a few extra bucks…..but he had an incredible career that garnerd him much attention, fame and wealth and fans that will never forget just how good this guy actually was and is. Bring on the new Black Sheep, I’ll listen. Thought occurs… RB started Rainbow with his own inimitable version of Black Sheep of the Family, so perhaps this coming update of the song is meant to bookend the Rainbow discography. In other words, this could be the final studio offering from Ritchie Blackmore’s Rainbow. If that should turn out to be the case, then I say Valé Ritchie… thanks for everything & be happy!.